Cuba: End The Blockade Immediately! A Resolution on “ending the economic, commercial and financial blockade imposed by the United States of America against Cuba” will once again be presented to the United Nations General Assembly (UNGA) on 27 October 2015. There is a special significance about bringing the Resolution, overwhelmingly endorsed by the UNGA for 23 consecutive years, to the attention of the world body this time. 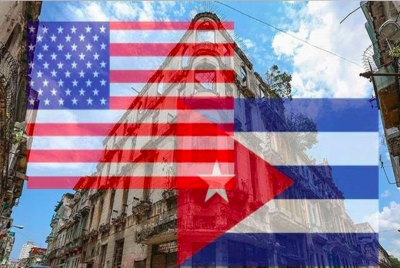 It is happening after the US restored diplomatic relations with Cuba on 17 December 2014. The announcement on the restoration of diplomatic relations was followed by the return of three Cuban anti-terrorist fighters who had been unjustly imprisoned in the US for years. President Barack Obama also informed the US Congress that he was removing Cuba from the list of States “sponsoring international terrorism” — a list which should never have included Cuba in the first instance since Cuba had been a victim of US engineered terrorism for decades, dramatized by the bombing of one of its civilian aircraft in 1976 that killed a large number of schoolchildren. Obama has also urged the Congress to put an end to the US blockade against Cuba. Some restrictions pertaining to travel to Cuba, telecommunications and remittances have been relaxed. But the blockade remains. Any entity that engages in any financial, commercial or other economic activities with Cuba continues to be penalized. A huge fine for instance was imposed upon a German bank in March 2015 just as an American company was subjected to a severe penalty for allegedly violating the blockade. In the last eight years or so, 42 fines have been imposed upon US and foreign entities amounting to more than 13 billion US dollars. The US blockade, needless to say, impacts adversely upon every sector of Cuban society, from food and health care to education and sports. If Cuba could buy goods and products from the US market — rather than from some faraway country — it could have saved billions and billions of dollars. In fact, it has been calculated that the 54 year old blockade has cost the Cuban economy more than 1.1 trillion dollars. This money could have been used to raise the standard of living of the Cuban people. It is because the blockade continues to impede Cuban development that many governments and civil society organizations in various parts of the world have called for its elimination since it was first introduced in 1961. The calls have become louder and louder over the decades. Last year when the UNGA voted on the Resolution to end the blockade, 188 member states supported the Resolution while only two opposed it and three abstained. The two opposing votes came from the US and Israel and the three states that abstained were Micronesia, Marshall Islands and Palau. Since Obama restored diplomatic relations with Cuba, many US civic leaders, Church figures and former public officials have openly demanded that the unjust, inhuman, immoral blockade be terminated immediately. Even current leaders have spoken up. In early October 2015, nine US State Governors sent a letter to the leadership of the US Senate and House of Representatives urging an end to the blockade and emphasizing the benefits of such a move to US’s agricultural industries. More significantly, a Pew Research Center poll conducted in July 2015 showed that 72% of the US population wants an end to the blockade, up from 66% in January 2015. The only remaining major obstacle now is the US Congress. Both the House of Representatives and the Senate are controlled by the Republicans and Republicans as a whole (there are a number of exceptions) are ideologically more averse to a socialist state like Cuba than the Democrats. Besides, there is a small but influential Cuban-American caucus in both the House of Representatives and Senate that is as antagonistic as ever to the Castro government in Havana. Both the outgoing House Speaker, John Boehner, and the Senate Majority Leader, Mitch McConnell, are against normalization of ties with Cuba. This is why after the October 27 vote in the UN General Assembly — expected to be almost unanimous in favor of the lifting of the blockade — a multi-national panel comprising representatives of governments that would have endorsed the Cuban position should seek a formal meeting with the House Speaker and the Senate Majority Leader to convey to them the feelings of the people of the world about the decades old suffocating embargo against a small nation of eleven million whose only wish is to preserve its independence, its sovereignty and its dignity. The leaders and members of the US Congress should be told in no uncertain terms that they cannot continue to ignore the voice of the international community, and indeed, the voice of their own people. If they fail to end the blockade now, if they fail to act out of a sense of justice and fairness, they will be damned forever and consigned to the rubbish heap of history.